I didn’t take a Christmas vacation, but I took a couple of weeks off from posting on this blog. I’ve been busier than ever writing blog posts in the last couple of weeks, however, and I have lots of new ones almost ready to share with you. Here’s a bit about what I’ve been doing the last two weeks, then I’ll tell you my commitments to you for the coming year. In December, I made a commitment to myself to clean up the little pieces of paper that clutter my desk. These scraps contained lots of useful information and lots of blog post ideas, but they existed in a form that was nearly useless to me. Over the last couple of weeks, I’ve cleaned up almost all the pieces of paper, eliminating the useless ones and rescuing the good ones by putting them into a digital format I can work with. I created a text file with line after line of things I want to research and bits of information I didn’t want to forget — like that I need a 10-millimeter wrench to change the air filter on my car and that my pupillary distance is 63 if I need to order custom reading glasses. I also started files for more than 30 blog posts rescued from these scraps of paper. Many of them are for So Much More Life, and several are for my catch-all blog Gip’s Front Yard. A few are for other projects, and a couple don’t seem to fit anywhere yet. Some of these files contain hundreds of words and don’t need much more to make them ready for you; others contain only a line or two of notes. My desk looks better now, but better yet, I have a great head start on 2012. My January project is a bit more mundane and boring: I have to type up some information for my taxes that’s missing from my bank account details because of my quibbles with Quicken, but I should have plenty of time this month to do that along with the much more interesting work of finishing all the posts I started — and starting many more, I hope. In 2011, I committed to bringing you useful, entertaining and interesting posts that are different from the kind you find on other simple living, minimalist blogs. Did I succeed? I also promised you two posts per week and short, direct posts that don’t waste your time. By the end of 2011, I was only offering one post per week, and many of my posts were flabby and long. Still, I think I offered a unique perspective that you couldn’t have found elsewhere. In any case, my 2012 commitment to you is one post most weeks. I’ll skip a week when I have nothing to say or no time to say it, and I’ll offer a second post on weeks when I have more to say than I can say in one. I also recommit to offering uncomplicated posts with as little flab as possible. I won’t stop telling my story along with my comments, however. I also commit to staying on topic much better than before. When I have something to say that doesn’t directly related to simple, deliberate living, I’ll post it on Gip’s Front Yard instead of trying to contort the message to fit here. 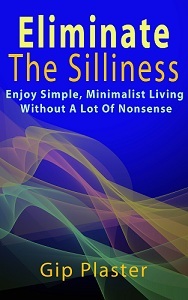 I’ll be back next Tuesday and most Tuesdays in 2012 with an interesting, entertaining and useful post about something related to minimalism and simple living. For this blog to be a continued success, however, I need your help expanding the conversation. Closed systems are dying ones, so I’m flinging open the doors to new readers and new ideas of all sorts. Will you help me stay on track and help me find others who would enjoy subscribing to and contributing comments to this blog? Will you make any commitments to me and to So Much More Life in 2012? Sounds like a good strategy for 2012, Gip – count me in on reading, commenting and helping you stay on track. Crystal recently posted Getting Paid to Read – My Dream Has Come True! Welcome back, Crystal. And happy new year to you! Hey Gip – Happy New Year! Hope you had a good (productive) break? I did have a good and productive break, and I missed posting during that time — although I did quite a lot of writing. I hope you’ll be a regular here in the coming year. I’m not making any very specific promises, but I can promise to be here all year and then some.